Nancy's path toward writing came later in life, and via an unconventional route. As an inventor (Pie Saver) and entrepreneur, she owned several different businesses over the years. With three grandchildren and a little more time on her hands, she decided to pursue a lifelong desire to write children’s books. The Munchy Bunch go on some spine-tingling adventures and must watch their backs when Candybar is up to his mischievous pranks! In her "spare" time, Nancy is also writing a YA novel, so stay tuned! 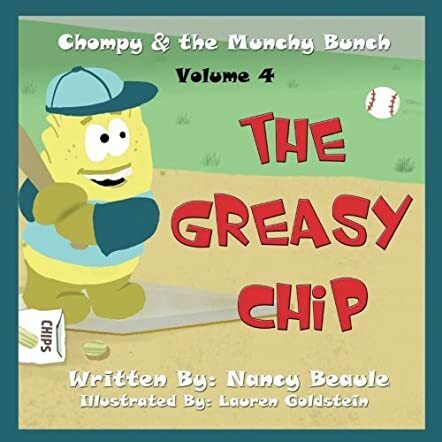 The Greasy Chip is the fourth book in the children’s series, Chompy & the Munchy Bunch, written by Nancy Beaule and illustrated by Lauren Goldstein. When word gets out that Coach Brock O. Lee is assembling a new baseball team at Munchytown’s school, the students are excited and can’t wait to try out for the team. Rivalries between Chompy and Candybar raise their ugly heads as the two both try out for the same team. During practice, after selections are made, the coach is disheartened to discover that the players he has chosen are sluggish, and puts them through a tough fitness regime in readiness for the first game. To his shock and surprise, however, he then discovers that lack of exercise is not his players’ only problem. I never get tired of reading stories from the Chompy & the Munchy Bunch series due to their high educational value. Nancy Beaule and Lauren Goldstein have beautifully portrayed how vitally important it is to maintain a healthy lifestyle, both through diet and exercise, if a child (or even an adult) is to succeed in any sport. The Greasy Chip shows that surviving on nothing but junk foods which are high in salt and sugar, containing absolutely no nutritional value whatsoever, will leave the consumer feeling lethargic, slow and unable to concentrate. With all the grease and sugar that the body is consuming, it has nothing with which to provide nutrition to the muscles and brain. The nutritional facts provided at the end of the book are presented in a fun way so that children will enjoy reading them and be more likely to adhere to the advice provided. I love how each of the characters really brings home the message of healthy eating and healthy living to children at such a young age. I wholeheartedly recommend The Greasy Chip to be read by those aged 5-12, as well as by parents, teachers and guardians in the school’s education system.